The current refugee crisis has produced a wave of xenophobia across Europe. Fascism and ultra-nationalism have also been on the rise. Because of the really large numbers of refugees all going to Europe, it seems to have put a strain on the countries’ resources and has led to some sort of political backlash which we are seeing in Europe at the moment — a resurgence of extreme right wing nationalist politics, such as UKIP in Britain, Marine Le Pen in France, and the Alternative for Germany (AfD) party. The rise in right wing nationalist politics in Europe means that many Europeans are now interested in preserving their culture. Some of them fear that the Muslim refugees will impose sharia law in their countries, which goes against Europe’s liberal democracies. Right wing extremism seems to be at its peak in Europe, especially in countries such as Germany, because of the large arrival of refugees into the country. For instance, the Alternative party for Germany (AfD) has gained momentum, and has won elections in several states based on the beliefs that they are anti-migration and anti-refugees. This shows that a growing number of people in Europe are not happy with the large influx of refugees coming into their countries. 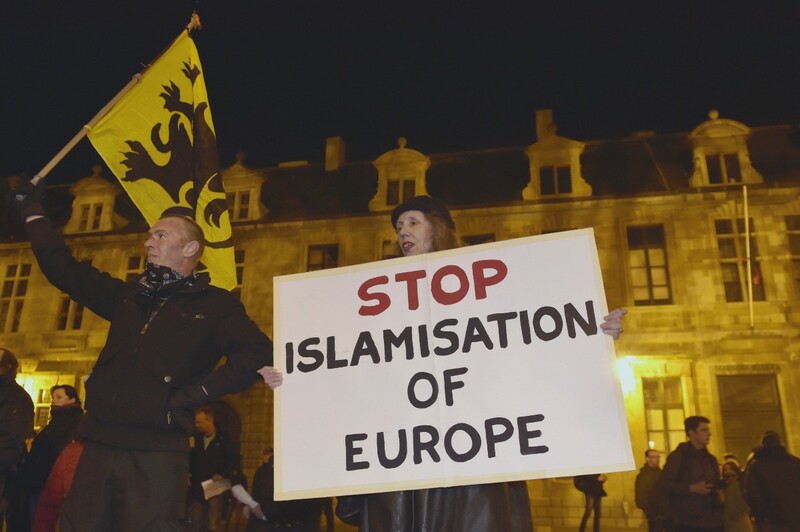 Many European’s fear that by accepting refugees it will lead to the Islamisation of the west, for example, in Germany there is an anti-Islam organisation called PEGIDA (Patriotic Europeans Against the Islamisation of the West) which is spreading throughout Europe; they argue that Europeans need to wake up to the threat of Islam. In the past two years the numbers of Islamophobic rallies have grown. The PEGIDA movement in 2015 carried out a lot of protests against Muslims in the country and thousands of people joined these rallies, creating a wave of fear into the community. Extremist and anti-migrant groups such as PEGIDA have carried out an increasing number of attacks on Muslims or people they assume are Muslims. Additionally, neo-Nazi groups have used the influx of refugees as well as the terrorist attacks in Germany in order to demonstrate the failure of the government when dealing with the entry of refugees into the country. Another possible reason for the rise in xenophobia across Europe could be because of the increase in terrorist attacks in Europe. Islamist terror attacks have taken place in countries such as France, Belgium, and Germany. One example of a terrorist attack took place in France when the satirical magazine Charlie Hebdo published an offensive cartoon of the prophet Muhammad, knowing that it would probably incite violence. Two armed men believed to be a part of al-Qaeda entered the magazine offices killing eleven people. ISIS later claimed that they were behind the Paris attacks. Many europeans saw these attacks as an attack on freedom of expression. Ironically, France have banned the veil, and also banned the hijab and burkini in some areas of the country; this exposes the hypocrisy of its secularist state. Unfortunately, there continues to be a rise in terrorist attacks all over Europe, more specifically in Germany, France, Belgium, and most recently England, resulting in the tragic deaths of many innocent people. Hence, many Europeans now have a fear that accepting refugees is a huge risk, as there may be terrorists among them. However, the individuals who were behind these terrorist attacks have been raised in the West, and thousands of British born and raised citizens have gone to join ISIS; so ISIS are finding it easy enough to recruit from European born citizens, let alone having to sneak in terrorists with refugees. ISIL has its own multilingual media arm, Al-Hayat, which produces videos using American-made GoPro action cameras. Al-Hayat has released videos featuring foreign fighters who speak Western languages and who encourage young people to come to Syria to wage violent jihad or help the caliphate in some other way. So, ISIS targets their videos towards specific audiences; for example, in one video a white Canadian jihadist in his early twenties encourages other westerners to join up. Their videos make jihad look attractive and meaningful; therefore this false depiction could be the reason as to why so many foreign fighters have travelled to Syria and Iraq to join IS. ISIL typically recruit’s Western youth who are isolated, uncertain, disillusioned, and who believe they have no purpose. Like other gangs, they offer a sense of family and belonging that appeals to teens and gives them an opportunity to join a group with a passionate purpose and direction. Therefore, one potential reason as to why many youth are joining ISIS could be because they feel marginalised in an increasingly xenophobic Europe, and believe that if they join ISIS they can be part of a ‘brotherhood’. It is important to remember that the Syrian refugees are fleeing for their lives because they disagree with what ISIS are doing. Muslims are the biggest targets of ISIS; so-called Islamic State have killed more Muslims than non-Muslims, showing that they will kill anyone who does not believe in their distorted ideology. Great hammer of Thor, that is porulfelwy helpful! Is that really all there is to it because that’d be flnagerbbstiag. Hmm it seems like your website ate my first comment (it was extremely long) so I guess I’ll just sum it up what I wrote and say, I’m thoroughly enjoying your blog. I as well am an aspiring blog blogger but I’m still new to the whole thing. Do you have any tips for beginner blog writers? I’d genuinely appreciate it. Hello There. I discovered your weblog using msn. That is a really neatly written article. I will make sure to bookmark it and come back to learn extra of your helpful info. Thanks for the post. I will certainly comeback. Thank you, I’ve just been searching for info about this topic for ages and yours is the greatest I have found out so far. However, what in regards to the conclusion? Are you positive about the supply? I think other website owners should take this internet site as an example , very clean and superb user pleasant design and style. I precisely had to appreciate you all over again. I’m not certain the things that I could possibly have undertaken in the absence of the entire suggestions revealed by you relating to my problem. It had become a real horrifying difficulty for me personally, but being able to see a well-written strategy you processed it made me to cry over gladness. I’m just happier for your advice and then have high hopes you comprehend what a powerful job you have been carrying out educating the rest through the use of a blog. I am sure you haven’t come across any of us. Hey very nice blog!! Guy .. Beautiful .. Amazing .. I will bookmark your web site and take the feeds additionallyKI am glad to search out a lot of helpful information here in the submit, we’d like work out more strategies in this regard, thanks for sharing. . . . . . I?¦m not positive the place you are getting your information, but great topic. I needs to spend a while learning more or figuring out more. Thanks for great information I was looking for this information for my mission. It¦s actually a great and useful piece of info. I¦m satisfied that you just shared this useful information with us. Please keep us up to date like this. Thank you for sharing. hey there and thank you for your info – I have definitely picked up anything new from right here. I did however expertise several technical points using this web site, since I experienced to reload the site many times previous to I could get it to load correctly. I had been wondering if your web host is OK? Not that I am complaining, but sluggish loading instances times will sometimes affect your placement in google and can damage your quality score if ads and marketing with Adwords. Anyway I’m adding this RSS to my email and can look out for a lot more of your respective fascinating content. Ensure that you update this again soon.. I genuinely enjoy reading on this web site, it holds good articles. It is really a nice and helpful piece of information. I am happy that you just shared this useful information with us. Please keep us up to date like this. Thanks for sharing. I really like your writing style, good info, thanks for putting up :D. “Inquiry is fatal to certainty.” by Will Durant. This website is mostly a stroll-by means of for the entire info you wanted about this and didn’t know who to ask. Glimpse here, and also you’ll undoubtedly uncover it. Can I just say what a aid to search out someone who truly knows what theyre talking about on the internet. You positively know learn how to convey a difficulty to light and make it important. Extra folks have to read this and understand this facet of the story. I cant consider youre not more popular since you definitely have the gift. Wonderful web site. Lots of useful info here. I?¦m sending it to a few pals ans also sharing in delicious. And obviously, thanks to your sweat! I beloved up to you’ll obtain carried out proper here. The sketch is attractive, your authored subject matter stylish. nonetheless, you command get bought an shakiness over that you wish be delivering the following. unwell for sure come more previously once more as precisely the similar just about a lot regularly inside of case you protect this increase. Hi there very cool website!! Man .. Beautiful .. Wonderful .. I will bookmark your website and take the feeds also?KI am satisfied to search out a lot of useful info right here within the put up, we’d like work out extra strategies on this regard, thanks for sharing. . . . . . I think this web site has got very good indited subject matter posts. hi!,I love your writing so so much! share we communicate extra approximately your post on AOL? I need an expert in this house to unravel my problem. Maybe that’s you! Looking ahead to peer you. My brother suggested I may like this blog. He was once entirely right. This publish truly made my day. You cann’t imagine just how much time I had spent for this information! Thank you! Have you ever considered about including a little bit more than just your articles? I mean, what you say is valuable and everything. However think of if you added some great visuals or video clips to give your posts more, “pop”! Your content is excellent but with images and videos, this site could definitely be one of the greatest in its niche. Awesome blog! I truly enjoy examining on this website , it holds superb articles. “A man of genius has been seldom ruined but by himself.” by Samuel Johnson. I really like your writing style, fantastic information, thanks for putting up :D. “Your central self is totally untouched By grief, confusion, desperation.” by Vernon Howard. I absolutely love your blog and find nearly all of your post’s to be exactly I’m looking for. can you offer guest writers to write content in your case? I wouldn’t mind creating a post or elaborating on some of the subjects you write related to here. Again, awesome weblog! Hey there, You’ve performed a fantastic job. I’ll certainly digg it and for my part recommend to my friends. I’m sure they’ll be benefited from this site. What i do not realize is if truth be told how you are not really a lot more neatly-favored than you may be right now. You are very intelligent. You already know thus considerably in relation to this matter, produced me in my view consider it from a lot of various angles. Its like men and women don’t seem to be involved except it is something to do with Woman gaga! Your individual stuffs outstanding. At all times take care of it up! Enjoyed looking through this, very good stuff, regards. “A man does not die of love or his liver or even of old age he dies of being a man.” by Percival Arland Ussher. Someone necessarily lend a hand to make seriously posts I would state. This is the very first time I frequented your website page and to this point? I amazed with the analysis you made to create this particular post extraordinary. Fantastic task! Hi, Neat post. There is an issue together with your website in web explorer, might check this?K IE still is the marketplace leader and a good section of folks will omit your fantastic writing due to this problem. Hmm it appears like your site ate my first comment (it was extremely long) so I guess I’ll just sum it up what I submitted and say, I’m thoroughly enjoying your blog. I as well am an aspiring blog blogger but I’m still new to the whole thing. Do you have any points for rookie blog writers? I’d certainly appreciate it. What i do not understood is actually how you’re not really much more well-liked than you might be now. You are very intelligent. You realize therefore considerably relating to this subject, made me personally consider it from numerous varied angles. Its like women and men aren’t fascinated unless it is one thing to do with Lady gaga! Your own stuffs great. Always maintain it up! I and also my buddies happened to be looking at the great pointers on your website and unexpectedly developed a terrible feeling I had not thanked the web blog owner for those strategies. My people are actually as a result very interested to read through all of them and now have in actuality been making the most of them. Many thanks for really being considerably helpful and also for making a choice on varieties of perfect tips millions of individuals are really desperate to be informed on. Our sincere apologies for not expressing gratitude to earlier. Hi, Neat post. There is a problem with your web site in web explorer, might check thisK IE nonetheless is the marketplace leader and a huge section of folks will pass over your great writing because of this problem. Hi there! Someone in my Myspace group shared this site with us so I came to check it out. I’m definitely loving the information. I’m book-marking and will be tweeting this to my followers! Excellent blog and excellent design. Good post. I learn something more challenging on different blogs everyday. It should at all times be stimulating to read content from different writers and observe a bit of one thing from their store. I’d choose to make use of some with the content on my weblog whether you don’t mind. Natually I’ll provide you with a hyperlink in your web blog. Thanks for sharing. Hi there! Someone in my Facebook group shared this website with us so I came to take a look. I’m definitely enjoying the information. I’m book-marking and will be tweeting this to my followers! Outstanding blog and outstanding design and style. Thanks for some other excellent post. Where else may just anybody get that kind of info in such a perfect approach of writing? I’ve a presentation next week, and I am at the search for such information. I have been browsing on-line greater than 3 hours today, but I by no means discovered any interesting article like yours. It¦s lovely price sufficient for me. In my opinion, if all webmasters and bloggers made excellent content material as you did, the internet might be a lot more useful than ever before. I have been exploring for a bit for any high quality articles or blog posts on this kind of area . Exploring in Yahoo I at last stumbled upon this website. Reading this information So i am happy to convey that I’ve a very good uncanny feeling I discovered just what I needed. I most certainly will make certain to don’t forget this site and give it a glance on a constant basis. It¦s actually a nice and helpful piece of information. I¦m satisfied that you shared this useful information with us. Please keep us up to date like this. Thank you for sharing. What i do not understood is actually how you are not really much more well-liked than you may be right now. You are so intelligent. You realize thus considerably relating to this subject, produced me personally consider it from numerous varied angles. Its like women and men aren’t fascinated unless it is one thing to accomplish with Lady gaga! Your own stuffs great. Always maintain it up! Hello, Neat post. There is an issue along with your site in web explorer, would check this… IE nonetheless is the marketplace chief and a big component of folks will pass over your excellent writing because of this problem. Valuable info. Fortunate me I discovered your website unintentionally, and I am surprised why this accident did not happened in advance! I bookmarked it. I just couldn’t depart your website prior to suggesting that I really enjoyed the standard information a person supply for your visitors? Is going to be again steadily in order to check up on new posts. Thanks for any other magnificent post. The place else may anybody get that type of info in such a perfect manner of writing? I have a presentation subsequent week, and I’m on the look for such information. I reckon something really interesting about your website so I saved to bookmarks. I was recommended this web site by means of my cousin. I am no longer sure whether or not this submit is written by him as no one else know such distinctive approximately my trouble. You’re incredible! Thank you! Attractive component to content. I simply stumbled upon your website and in accession capital to assert that I acquire actually enjoyed account your blog posts. Any way I will be subscribing for your feeds and even I fulfillment you access consistently quickly. I have been browsing on-line greater than 3 hours these days, but I by no means discovered any interesting article like yours. It is beautiful worth enough for me. Personally, if all website owners and bloggers made just right content as you did, the web will be much more helpful than ever before. “Dignity is not negotiable. Dignity is the honor of the family.” by Vartan Gregorian. You really make it appear so easy along with your presentation but I find this topic to be really something which I think I might by no means understand. It kind of feels too complex and extremely large for me. I am taking a look ahead to your subsequent publish, I¦ll try to get the hang of it! Wonderful site. A lot of helpful information here. I?¦m sending it to a few pals ans additionally sharing in delicious. And of course, thanks to your effort! Outstanding post, I think blog owners should acquire a lot from this site its very user genial. Some truly fantastic info , Gladiolus I discovered this. “They are able because they think they are able.” by Virgil. Excellent site. Lots of helpful info here. I am sending it to some friends ans also sharing in delicious. And certainly, thank you on your effort! Hi there! I know this is kinda off topic but I’d figured I’d ask. Would you be interested in exchanging links or maybe guest writing a blog post or vice-versa? My blog goes over a lot of the same topics as yours and I believe we could greatly benefit from each other. If you are interested feel free to shoot me an e-mail. I look forward to hearing from you! Great blog by the way! Thanks , I’ve recently been looking for information about this topic for ages and yours is the greatest I’ve discovered so far. But, what in regards to the conclusion? Are you sure concerning the source? I genuinely enjoy examining on this web site, it holds fantastic blog posts. “One doesn’t discover new lands without consenting to lose sight of the shore for a very long time.” by Andre Gide. I believe this internet site has some rattling superb information for everyone : D.
I do like the manner in which you have presented this situation and it does supply me some fodder for thought. However, coming from what I have witnessed, I just trust when other commentary pile on that people keep on point and not embark upon a tirade regarding the news du jour. All the same, thank you for this exceptional piece and while I can not necessarily agree with it in totality, I value your standpoint. Fantastic site. Lots of useful info here. I am sending it to several friends ans also sharing in delicious. And naturally, thanks for your effort! Hello! I know this is kinda off topic nevertheless I’d figured I’d ask. Would you be interested in trading links or maybe guest authoring a blog article or vice-versa? My blog discusses a lot of the same subjects as yours and I believe we could greatly benefit from each other. If you are interested feel free to shoot me an email. I look forward to hearing from you! Awesome blog by the way! You made some first rate points there. I appeared on the internet for the issue and found most individuals will associate with together with your website. Some truly nice and useful info on this internet site, too I think the pattern contains great features. Very interesting subject, thanks for putting up. “Challenge is a dragon with a gift in its mouthTame the dragon and the gift is yours.” by Noela Evans. Youre so cool! I dont suppose Ive read anything like this before. So good to seek out any individual with some authentic ideas on this subject. realy thank you for beginning this up. this website is one thing that is wanted on the internet, someone with somewhat originality. useful job for bringing something new to the web! Great ?V I should certainly pronounce, impressed with your site. I had no trouble navigating through all the tabs and related information ended up being truly simple to do to access. I recently found what I hoped for before you know it at all. Reasonably unusual. Is likely to appreciate it for those who add forums or something, site theme . a tones way for your customer to communicate. Excellent task.. Awesome blog! Do you have any recommendations for aspiring writers? I’m hoping to start my own site soon but I’m a little lost on everything. Would you propose starting with a free platform like WordPress or go for a paid option? There are so many options out there that I’m completely overwhelmed .. Any ideas? Kudos! My brother suggested I may like this web site. He was once totally right. This put up truly made my day. You can not imagine just how so much time I had spent for this information! Thank you! Spot on with this write-up, I really suppose this web site wants much more consideration. I’ll most likely be again to read much more, thanks for that info. I?¦ve learn several just right stuff here. Definitely value bookmarking for revisiting. I surprise how so much effort you set to make the sort of magnificent informative website. What i don’t realize is actually how you are no longer really a lot more smartly-liked than you may be now. You are very intelligent. You recognize therefore significantly in relation to this topic, produced me for my part imagine it from a lot of varied angles. Its like women and men aren’t fascinated unless it is something to do with Girl gaga! Your individual stuffs great. At all times maintain it up! I¦ll immediately take hold of your rss as I can’t to find your e-mail subscription hyperlink or newsletter service. Do you have any? Kindly permit me know so that I could subscribe. Thanks. Hello very nice web site!! Guy .. Beautiful .. Wonderful .. I will bookmark your website and take the feeds additionallyKI’m satisfied to find so many useful information here within the publish, we’d like work out more strategies in this regard, thanks for sharing. . . . . .
Nice post. I was checking continuously this blog and I am impressed! Very helpful information specially the last part 🙂 I care for such info much. I was looking for this particular information for a very long time. Thank you and good luck. It’s really a great and useful piece of information. I’m glad that you simply shared this helpful information with us. Please stay us informed like this. Thanks for sharing. It’s really a nice and useful piece of information. I am satisfied that you just shared this helpful info with us. Please keep us informed like this. Thanks for sharing. What’s Going down i’m new to this, I stumbled upon this I have found It absolutely helpful and it has helped me out loads. I hope to contribute & help different users like its aided me. Good job. Have you ever thought about creating an e-book or guest authoring on other sites? I have a blog centered on the same subjects you discuss and would love to have you share some stories/information. I know my subscribers would enjoy your work. If you are even remotely interested, feel free to shoot me an e-mail. Hello to every , as I am actually eager of reading this blog’s post to be updated daily. Youre so cool! I dont suppose Ive learn anything like this before. So good to seek out any individual with some authentic thoughts on this subject. realy thanks for beginning this up. this website is one thing that’s wanted on the internet, someone with a bit of originality. useful job for bringing something new to the web! Excellent post. I was checking continuously this weblog and I am inspired! Extremely helpful information particularly the last section 🙂 I take care of such information a lot. I was looking for this particular information for a long time. Thanks and best of luck. Hiya, I am really glad I’ve found this info. Today bloggers publish only about gossips and net and this is actually frustrating. A good web site with exciting content, that’s what I need. Thanks for keeping this site, I’ll be visiting it. Do you do newsletters? Cant find it. Woah! I’m really digging the template/theme of this website. It’s simple, yet effective. A lot of times it’s difficult to get that “perfect balance” between superb usability and visual appeal. I must say you’ve done a excellent job with this. In addition, the blog loads super fast for me on Safari. Superb Blog! This web site is my intake, real great layout and perfect subject material. hey there and thanks for your information – I’ve definitely picked up something new from right here. I did alternatively expertise a few technical points the use of this site, since I experienced to reload the web site a lot of occasions previous to I may just get it to load properly. I have been brooding about if your web hosting is OK? Now not that I am complaining, but sluggish loading cases times will often impact your placement in google and can damage your high-quality score if ads and ***********|advertising|advertising|advertising and *********** with Adwords. Anyway I am including this RSS to my e-mail and could look out for a lot extra of your respective exciting content. Make sure you update this once more soon..
I’m no longer sure where you’re getting your info, but great topic. I needs to spend a while studying more or understanding more. Thank you for fantastic information I used to be in search of this info for my mission. Hi there very nice website!! Guy .. Beautiful .. Amazing .. I will bookmark your website and take the feeds also…I am happy to find a lot of useful info right here within the submit, we’d like develop extra strategies on this regard, thank you for sharing. Really wonderful info can be found on blog. “You don’t get harmony when everybody sings the same note.” by Doug Floyd.